This club has 900 gymnasts training only once / week. NO competitive team. This is GREAT!!! Everyone active and having fun! An excellent modification to the old relay race warm-up. Here’s that music on YouTube. Teach kids how to avoid collisions – weaving, evading – moving to an open space. Tumbl Trak is sponsoring a series of videos appropriate for all children, not just gymnasts. It will be fast and easy to find new games. Here are a few video stills. Availability should be announced SOON. What is the song at 0:19? Invented by Dan Niehaus at Westwinds Gymnastics, Lethbridge, the legacy lives on. It’s still done in Christchurch, New Zealand, I’m told. 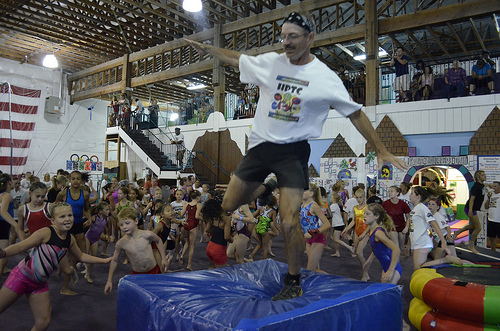 Here I am leading 100 gymnasts at Gymnastics Camp in Idaho. There has got to be a video somewhere?!?!?! These are pre-competitive girls. But there are plenty of good ideas for Rec, too. That’s the Sparklers program at Gym-Nation. In 2011 I don’t have much confidence that children will be physically educated in P.E. class. But they certainly would be with this teacher. Warm-up for a group of Grade 1-3 students in a school gym, utilizing some principles typical of gymnastics. That’s G.Y.M. Consulting out of Regina, SK, Canada. Saskatchewan is a leader in the field of gymnastics instruction for teachers. Brian Lewis is a physical education consultant with Regina Catholic Schools. Check out his sites http://growingyoungmovers.com/ and http://www.blognasium.com/. I find school classes with younger children easier than rec classes, but older children schools are harder than both. I try to work around a number of themes in schools; landing, rolling, inversion, moving in different ways, balancing and shapes, and partner/group work. Then we might add benches to all of those activities. So far I haven’t used any other (higher) equitment – with 30 children in a class accidents are likely, and even with back to wall I can’t be checking everywhere at once. You can imagine that if I’m cautious, the regular teachers who aren’t so familiar with gymnastics will be even more so.